One in three of us has high blood sugar and is at risk of developing type 2 diabetes. Despite this, new research from preventative nutrition experts Pharma Nord has revealed that just one in 10 people is worried about developing diabetes and one third of us don’t know what their blood sugar level is. Naturally-occurring glucose is an important fuel from wholefoods in our diet, but over consumption of refined sugar in manufactured foods and drinks has become a real issue. High blood sugar can be caused by a number of factors including frequent snacking on processed foods and drinks, sugar cravings or hunger pangs between meals, over-eating refined foods, regular dieting and weight gain. Three balanced, wholesome meals can prevent your blood sugar levels from dropping. Missing meals or eating refined foods can play havoc with blood glucose making you feel more hungry and more likely to stray towards sugary snacks. Breakfasts containing high starch and added sugar will only lead to cravings later in the day. Eggs, healthy fats and whole grains can help you feel fuller for longer, with slow-release energy. Smoothies and juices shred or remove the fibre completely, exposing us to high levels of fructose, which raises blood sugar. Chromium works with insulin to maintain healthy circulating levels of glucose in the blood stream. It is a mineral found in natural foods but is in short supply in the modern British diet. Chromium supplements can help to reduce sugar cravings and convert fat, carbohydrates and protein into energy, making them good for weight loss. Exercise improves your insulin sensitivity, which helps control blood sugar levels. Exercise is also a good distraction, taking your mind off sugary treats! Giving up sugar ‘cold turkey’ can initially lead to poor glucose supply to the brain, which causes poor serotonin regulation and a subsequent drop in mood. This can happen around three or four days after giving up sugar and can lead to binges and cravings. This is temporary and will pass as your system gets used to slower-release forms of fuel to the body and brain, but you may want to time this for over a weekend if you know you have an ingrained sugar habit. We typically have a blood sugar low at 4pm when traditionally the tea and cakes were wheeled out. If this is your point of least resistance, eat a healthy snack at this time or just before. Although less snacking overall is the ideal scenario, it’s preferable to choose a better snack at the right time than mainline the sugar later. Constant cravings for sugar can indicate that there aren’t enough healthy, good-quality proteins and fats in your diet, as these register satisfaction in the brain, whereas carbohydrates do not. Be particularly aware of this if you’re a vegetarian or (especially) a vegan. Xylitol is the best sugar substitute choice, with some positive effects seen on weight loss, but it can still keep a sweet tooth alive. Substitute it for sugar in tea or coffee, then wean yourself off it bit by bit over a few weeks. Use natural, slow-release sugars that provide a sweet taste, like unsweetened coconut, ground almond, natural vanilla essence and unsweetened apple puree. Coconut contains plant-saturated fats called medium-chain triglycerides (MCTs) that help satisfy any need for sugar as they provide a dense energy source. Use as unsweetened desiccated coconut or flakes. Use cinnamon as much as possible: it contains a bioflavonoid called MHCP (methylhydroxychalcone polymer) that mimics insulin, actively moving sugar into cells for energy and sensitizing insulin receptors. 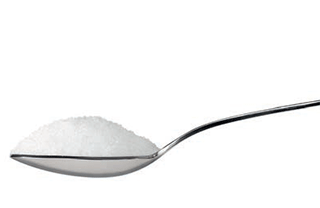 A teaspoon a day helps balance blood-sugar levels in people with diabetes. It’s highly effective at telling the brain that you’ve eaten something sweet, with positive rather than negative consequences. Add it to coffee, tea, yoghurt, berries and curries. A small portion of starchy carbs, such as new potatoes or sweet potatoes, can be included at dinner if you’re suffering late-night binges. You can then wean yourself off this as you regulate energy and cravings while giving up refined sugars. If you really need a sweet hit, choose a banana – they calm by helping levels of the anti-anxiety neurotransmitter gammaaminobutyric acid (GABA) and serotonin. Full-fat plain yoghurt with banana, cinnamon and coconut can satisfy.